Alfred George Stephens, often known simply as A G Stephens, was an Australian poet and literary critic who made regular contributions to the Sydney-based magazine The Bulletin. He set out to bolster and encourage the concept of Australian literature in its own right, even though many writers had strong European influences. He was born on the 28th August 1865 in the Queensland township of Toowoomba. His parents had emigrated from Britain, his father a Welshman and his mother Scottish. His childhood featured a decent education at the local grammar school. Alfred was an avid reader and studied the Classics, English and French. He was fortunate that his father had a part-ownership in the Darling Downs Gazette and the boy was able to foster his interest in printing in the newspaper’s composing room. It was at the Toowoomba Chronicle though where he secured his first period of employment after leaving school, working in the printing department, and he followed this with a spell at a printer/bookbinding business in Sydney. All of this was good experience for his later career as a journalist and editor and, in 1889, he took up the editorship of the Gympie Miner back home in Queensland. As time went by Stephens found himself in similar appointments for The Boomerang, in Brisbane, and the Cairns Argus. The Boomerang provided him with his first exposure to Queensland politics and literature reviewing and he wrote a prize-winning essay and pamphlets on local political issues. At the age of 28 though he felt it was time to explore the world a bit and he set off on a journey that took in the United States and Canada, starting in San Francisco and traversing the continent. He then set sail for Britain and then on to France. While working as journalist in Britain for the Daily Chronicle he was invited to join the staff of The Bulletin in Sydney and so, a year after leaving, he was back in Australia. He set up the literature section known as the Red Page, an outlet for new Australian poets to be heard. Stephens came into contact with many new writers including Barcroft Boake, Bernard O’Dowd and Robert Crawford and many up and coming writers probably owed their early success to the patronage and assistance offered by Alfred Stephens. Some of his own poems appeared in the paper including, in 1902, a small volume called Oblation. He seemed to be more interested in the editing and reviewing of other people’s work though and set up literary magazines for this purpose. He stayed solvent by acting as a literary agent, a journalist and lecturing on Australian poets at a variety of places including Melbourne. He never became rich but lived a relatively happy life, marrying Constance Smith in 1894 and fathering six children. The two had met when Stephens was living and working in Cairns. He was a renowned interviewer and wrote articles following meetings with the likes of Somerset Maugham, Gladys Moncrieff and J C Williamson. 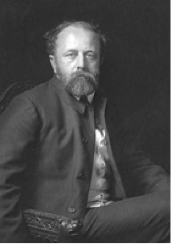 Alfred George Stephens died suddenly on the 15th April 1933, in Sydney. He was 67 years old.